How clever is the Breyers Ice Cream employee who turned ice cream into Christmas tree ornaments? You can do it too, or hand it over to the tweens and teens to make with their friends. Breyers used a 1.5 quart container of their Homemade Vanilla Ice Cream. You can, of course, use holiday flavors: candy cane ice cream, eggnog ice cream, gingerbread ice cream, etc. Find more nifty ice cream creations at Breyers.com. 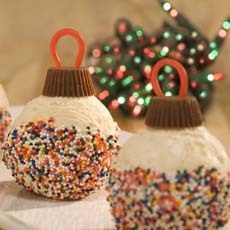 Ice cream ornaments for eating, not hanging. Photo courtesy Breyers. 1. LINE a jelly roll pan with aluminum foil, then spray with nonstick cooking spray. Freeze for at least 20 minutes. 3. MAKE the ornament “hangers.” Poke two holes in the small, flat side of the peanut butter cups with a skewer. Add a licorice “hanger” by pushing the ends into the holes. Freeze. 4. PRESS two scoops together to form a completely round ornament; repeat with the remaining scoops for a total of 12 ornaments. Arrange them on the pan and freeze at least 1 hour. 5. ROLL the ornaments in the sprinkles, leaving a bare spot on top to attach the hanger. Attach the hanger by pressing it onto the top of the ornament. Freeze for 3 hours or until ready to serve.